The Change in Action week started with the kind yet powerful words from Sarah Adeel, founder of LettuceBee Kids who told us about the street children situation in Pakistan and her challenges. Saad Khan, CEO of Gillette Pakistan complemented the picture about the situation in the country through his experience. In a few hours, 400 MBA students understood the challenge they had in front of them and how they should approach it through the design thinking process to make a change in the lives of those in need. We learned the process and the power of “Design Thinking” through a very simple exercise: creating a wallet for a team member that fit their needs. After having a clear understanding, we were able to replicate the model of discovery, interpretation, ideation, experimentation and evolution to the LBK challenge. We brainstormed to better understand the situation faced by children and their families in Pakistan. We further looked at LBK from the eyes of potential volunteers, charitable contributors, and other people that would have an emotional connection and/or need to connect with the less fortunate or give back to society in some way. Following the concept of “Design Thinking”, we generated as many ideas as possible keeping as only constraint the relevance to the perceived needs of the end user. With a similar approach it’s easy to end up with the most diverse and unrelated ideas, some were just plainly not feasible! But that’s where the power of the newly learned framework became clear. After the creative divergence, instead of trying to find only one solution and killing all the others, we landed at an integrated solution. To finalize the process we prototyped our solution and got as much feedback as possible by contacting people with relevant knowledge in and out of school, such as banks in Kuwait. The feedback we received helped us improve our solution and proved that the idea was valid. The key learning from this process was: 1) design the idea for a specific user, 2) set no limits (let your imagination flow), and 3) merge and integrate the ideas. LBK Keep the Change Program: Allows bank account users to forward part of their credit card payment to a savings account and another part to an NGO. This encourages users to automatically save as well as contribute to a good cause from each of their ordinary purchases on their credit cards. This is also attractive to banks that are looking to be socially responsible. Thank you letters with the results of their contributions and showing appreciation for their support are sent from LBK to help build an emotional tie and reinforce this positive behavior. LBK Loyalty Card Program: LBK can match their needs with volunteers’ abilities by keeping a database with their skills and contact information. Volunteers receive a loyalty card where they can keep track of the hours they have volunteered at LBK and after a certain amount of hours they are rewarded with goods made by the children, (postcards, art crafts, etc) which will remind them of the children they are supporting. The Change in Action was overall a great experience that we will never forget. As we only had two days to work on the idea, we spent many hours to make sure we had a viable idea and that it was nicely packaged to be presented. When we received the news that we were one of the eight finalist groups (out of 61), we were psyched! That was the opportunity to present to 200 students and the panel (Sarah Adeele, Saad Khan, and IE IMBA Associate Dean, Erik Schlie) an idea that we think can offer a better future to these kids. It felt great to be the winning team and see the impact that all our hard work and effort will have in that community. 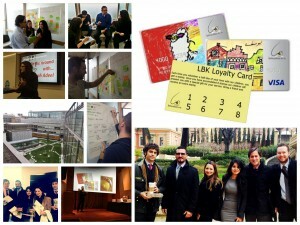 However, the best part is that Sarah will take back to Pakistan 61 ideas to help LBK become a sustainable organization. If you would like to read more about this particular Change in Action Module, click here to read another article published on the BusinessBecause website called “The Power of 450 MBA Students Thinking Like Designers” by IE Business School professor C. Todd Lombardo.